Each year on the first Monday of September, our country celebrates Labor Day – a homage to the non-exploitative contributions made by American workers to the nation’s economic growth and development. For many, this day revolves around pools, hot dogs, and enjoying some cold beverages. While the aforementioned activities are enjoyable, here’s five atypical activities we recommend this Labor Day that you can enjoy with friends and family. 1. Visit an art museum. The Denver Art Museum is offering free admission on September 2nd. 2. Go for a bike ride. The Cherry Creek bike path is one of the most popular biking trails in Denver — and one of the prettiest. A great section of the trail picks up on the north side of the Denver Country Club and drops you down at confluence park next REI. 3. Attend the Rocky Mountain Showdown. It’s the annual battle for Colorado college sovereignty between the CSU Rams and the CU Buffs. The battle returns to Sports Authority Field at Mile High on Friday, Sept. 1, at 6 p.m.
4. Go to a Rockies game. Cheer on the Colorado Rockies as they take on the San Francisco Giants in a three-day series. Enjoy a hot dog and cold beer while you root, root, root for the home team. 5. Visit Abrusci’s patio. 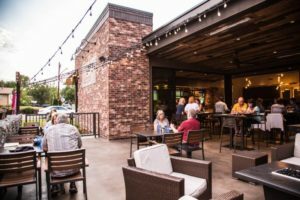 Come join us on our lovely patio! Enjoy a delicious wood-fired pizza paired with exceptional wines and craft beers from around the world. Enjoy this much-deserved day off of work, get away from the crowds, and enjoy our contemporary rustic environment with the people you love most. Get tasty deals on delicious meals delivered straight to your inbox, sign up for our newsletter to receive exclusive deals and offers.